Lock in a great price for citizenM Schiphol Airport – rated 8.8 by recent guests! Close walking distance (5 minutes) to the airport arrival/departure hall. Easy self check-in, with help if needed. Quick and easy self check-out in the morning. The cool features and amenities to the hotel gave it a very unique touch! The hotel is next to the airport. Very basic. But sound-proof. Location is great. About 400m walk from terminal. Rooms are small but very comfortable. Loved the view of the easyjet tarmac. We suffered a medical emergency which had us spending the first night in the hospital instead of at the hotel, and they comped us a second night without us even asking, which was incredibly generous, thoughtful, and appreciated. Very easy to check in and check out, very clean, room is absolutely amazing with all the gadgets it has and how you can control everything in the room from an Ipad. It was quite a pleasurable stay and extremely comfortable bed. We love the mood, the lighting of your room, the smart room tablet (our son loved that!) the efficient ergonomics of the plan layout, and its close to our gate for an easy and quick connect to our flights abroad...The breakfast was awesome complimented with awesome hospitality of your hosts! An Absolutely Excellent Excellent business model Michael Levie & Rattan Chadla!! Only there for 8 hours to get a little sleep with a 9 hours layover. It was very clean and efficient. Easy check in and out. Room was very different and "all we needed". I wouldn't want to spend days there because of the size but it was perfect for our needs. Loved the clever use of space in the rooms. The shower was really good. Just as advertised. The bed was very comfortable. The public spaces were also comfortable. The staff was very welcoming and helpful. The location made traveling so easy and stress free. citizenM Schiphol Airport This rating is a reflection of how the property compares to the industry standard when it comes to price, facilities and services available. It's based on a self-evaluation by the property. Use this rating to help choose your stay! One of our best sellers in Schiphol! citizenM Schiphol Airport is a modern design hotel at Schiphol Airport, offering rooms with adjustable colors and flat-screen TVs. It is within walking distance of the airport terminals and train stations. All rooms at citizenM Schiphol Airport have king-size bedding and a private bathroom with a powerful rain shower. Guests can benefit from free Wi-Fi, free movies and adapters for US, UK and EU plugs. With the Ipad minis guest can modify room color, climate control, control the smart-tv and also adapt the blinds and black-out curtains. Guest can also bring and connect their own device. The hotel restaurant and bar CanteenM is open 24/7 and serves quality coffee in the morning. It also offers several snacks, salads, sandwiches and sushi. In the evening guests can grab a beer or have a tasty cocktail. 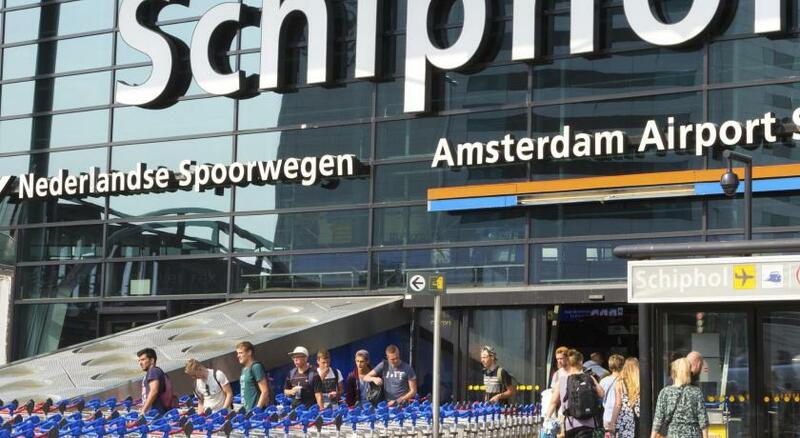 The citizenM Schiphol Airport is just a few minutes walking distance from the main terminals. It has direct connections to Amsterdam city center and business districts via a 24-hour train service. When would you like to stay at citizenM Schiphol Airport? The rooms have a king bed, a rain shower, free movies on demand and award-winning design furnishings. House Rules citizenM Schiphol Airport takes special requests – add in the next step! ATM card Debit card citizenM Schiphol Airport accepts these cards and reserves the right to temporarily hold an amount prior to arrival. citizenM Schiphol Airport accepts these cards and reserves the right to temporarily hold an amount prior to arrival. Small room where all facilities is stucked to each other. Very expensive as to what it offers. Basically you pay for the modern decoration. Its easy that its near the airport. Clean and very modern environment. Room size was a bit small. Made it a bit tight for luggage and movement around the room. Right next to the airport was perfect for early flight. Size of bed was great. Plenty of room. Breakfast was absolutely amazing !! Fresh fruit, lovely bread and good selection of herbal teas. I also simply loved the area where you could sit down and have breakfast, it was quirky with some modern arty stuff around. Very disappointed for the office view room. Look forward to an airport view room but gave us office view room. High-tech hotel. Good Breakfast and location. Staff is helpful. Great selection of Movies available free. Lovely Veggie food options. It was exceptionally well sound proofed considering how close to the run way it was.